Custom decks are made from all different kinds of materials, can wrap around pools and spas, and are built to any specification. At Decks, Decks and More Decks, our specialty is custom decks; built to the specific needs of our Omaha customers. And part of what makes our decks custom are all the additional features and accessories that make your deck unique. No matter the material you select for your deck – low-maintenance wood-alternative, cedar or mixed decks – accessories and features will add to your family’s enjoyment of a custom deck. For instance, benches can be built into any custom deck for additional, low-maintenance seating. Include planters for additional beauty. Lighting can also offer additional aesthetic appeal on custom decks, as well as function for evening outdoor events. 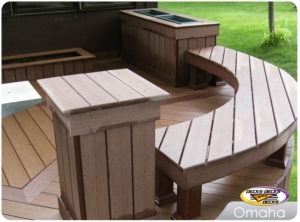 Outdoor events can also be made more enjoyable with a custom bench built into your deck. A custom deck for your Omaha home can be customized to fit your family’s entertaining needs – offering additions that need little-to-no maintenance while adding to the enjoyment of your custom deck. This entry was posted in Custom Decks Omaha and tagged custom deck builder omaha, custom deck omaha, low maintainence decks omaha on April 30, 2015 by Decks, Decks and More Decks. Custom deck building is comprised of many components. From the materials, to the design to the aesthetics, our Omaha custom decking company builds decks that are durable and beautiful. Part of a deck’s durability and aesthetic appeal is related to deck drainage. Deck drainage systems are ideal for raised decks for two main reasons. First, they deflect water by collecting it and driving it away from the home and foundation. Allowing air flow and ventilation is vital to the life of your home’s structure and of the deck. In addition, deck drainage systems will provide your Omaha home with more usable living space below the custom raised deck. 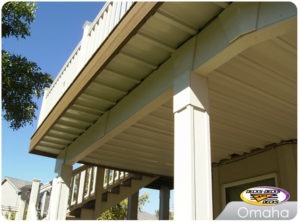 It’s attractive and durable, and will help brighten the space below the deck – making it more usable and enjoyable. At Decks, Decks and More Decks all our custom decks are built to the specific needs of your family, while taking into account safety, longevity and beauty. A deck drainage system will only add to the function and beauty of your custom deck. This entry was posted in Custom Decks Omaha and tagged custom deck builder, custom deck contractor omaha, custom deck omaha, deck drainage system on April 6, 2015 by Decks, Decks and More Decks.